At Alice No. 10 live shows there is much crowd surfing, head-banging, moshing. and even diving into the audience, things usually considered taboo in the idol world. However stirring up the audience is part of the fun. This is a neo-idol that has a completely different concept, one that will pump fresh blood into the idol industry, that largely mass-produces imitations of other idols. 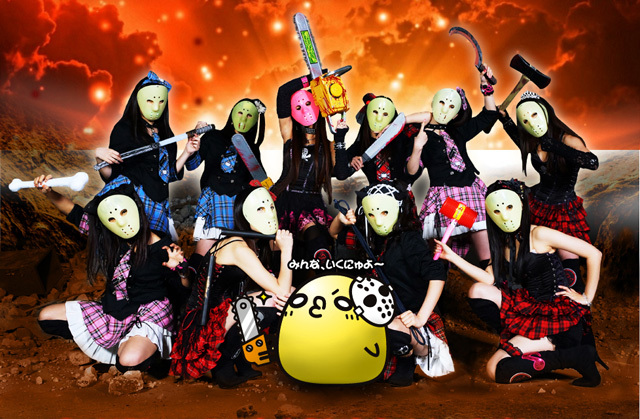 They appear on stage wearing Jason’s mask and carrying chainsaws, presenting a performance fraught with violent images. Their music was created by Koji Miyashita who made “maru・maru・mori・mori”, the theme song of the drama “Marumo no Okite”. Once somebody sees them, soon they will be talking and Twittering about them, and word of mouth is growing quickly. They performance marks them as a shocking, impressive next-generation idol unit. Their melodies are POP but interludes, suddenly change to heavy metal. They are a very active group, who are growing their passionate otaku fan base world.